The day was December 29, 2012. People began to hear loud, rhythmic Native American drumming coming from an atrium inside of the Mall of America. Large crowds of people began to gather to see what the commotion was all about. As one got closer one could hear the continuous BOOM BOOM of drums and native chants drowning out anything else that was audible in the space. If you had come to the edge of the atrium and looked down from the railing you would have seen over a thousand people gathered on the ground level. You would have seen that in the center is where the drumming was coming from, and around them stood people clapping and singing to the rhythm. In the outer layer of the gathering, people were moving in a circular rotation around the rest of the group. This is a round dance, “flash mob” style protest, put together by the “Idle No More” indigenous rights movement from Canada to bring attention to bill C-45. This bill, among other things, relinquishes the protection that was placed on natural waterways that pass through native lands and opens the door to commercial developments on these lands without their consent. This same day and week, many similar protests happened worldwide in support of the Idle No More movement.Idle No More was founded in December, 2012 as a movement fighting to protect the lands and sovereignty of aboriginal peoples of Canada. In the wake of new legislation that was threatening treaties that were previously signed to protect these peoples and their environment, Idle No More stands as the bullhorn letting the world know that we can no longer stand still and let these things come to pass. This is a running issue in the modern world. Colonization, without a doubt, has had and continues to have a negative effect on aboriginal people all over the planet. These people represent the side of humanity that is still seeking to honor and preserve the planet that feeds us all. Often times, it is these people and organizations that have been started to protect these people that are at the forefront of environmental preservation. To aboriginal people all over the world, there is a resounding theme that connects them. The air, water, fire and land of our world is not to be bought or sold. Earth is not for sale and the future survival of our children on this planet is not up for negotiations. This logic way too often comes in direct contradiction to corporate and governmental ambitions to exploit every resource that it can find for profit. Because of this, when plans for legislation are put together to determine how governments and corporations will interact with the environment, they seem to always exclude the council of aboriginal people whose livelihood depends solely on the environment. On December 6, 2015 in Paris, France, 195 nations were in a meeting to negotiate the United Nations climate pact. Outside the conference were people that came from all over the world, unified in protest, demanding that indigenous rights be included in the negotiations of the UN. 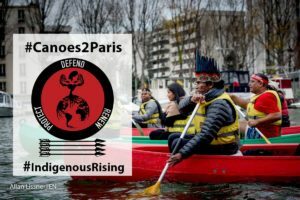 Under the hashtag #Canoes2Paris, indigenous people and supporters made their demonstration by kayaking down “La Seine” a river that flows through Paris and out into the English Channel. They drummed and burned sage. They waved signs that read things like “defend the sacred, protect the water” and “clean air, clean water, clean soul”. They sang songs, played instruments and prayed, all for the recognition of indigenous rights. This was important for them because countries like Norway, the United States and others were pushing for indigenous rights to be dropped from the legally binding parts of the UN agreement, afraid that they would become a legal liability. The discontent with global leadership has not been limited to issues of the environment and indigenous rights. If we analyze the last decade there seems to have been an upsurge in large movements expressing their disapproval of how their governing systems have been handling everything from social and religious to economic issues. December 17, 2010, a man by the name of Muhammad Bouazizi, a street vendor in Tunisia, would go down in history as the man that lit the flame for what is known as “Arab Spring”. A sequence of events that led to the collapse of Tunisia, Egypt and Yemen, as well as the political reform of other neighboring Arab countries. Bouazizi vended to take care of his family and for some time had been under constant ridicule from Tunisian authorities. Police would often harass people like Bouazizi in exchange for bribes so that they would be left alone to do their business. Bouazizi did not have money to pay off police and had just the night before purchased produce on credit for him to sell in the morning. He started his day early and began to work as he normally does. Then the police harassment came. For those that are not socially connected and don’t have money for bribes, this process of police harassment can become very humiliating. His produce and cart were tossed to the side and his electronic scales were confiscated. He was slapped, roughed up, spat on and even took insults to his deceased father. He was humiliated and then left not able to work and still in debt for what was purchased on credit. Desperate he went to the governor’s office to complain and ask for his scales back. The governor refused to see him. Bouazizi was quoted as saying “If you don’t see me, I’ll burn myself”. And with a can of gasoline he got from a nearby gas station while standing in the middle of the street in front of the governor’s office, he shouted “How do you expect me to make a living?”, covered himself with gasoline and lit himself on fire and later died. This sparked large protest that subsequently led to the president of Tunisia fleeing the country. People of Arab nations saw this as an opportunity to express their displeasure with their political systems and the people in charge. Millions protested in countries all over the Arab regions and were able to either force leaders out of office or spark political reform. People are losing trust for political leadership all over the globe. More and more people are becoming aware of the flaws in their systems of governments everyday. Things like social media and camera phones make it easy for what is happening to be spread worldwide in a matter of seconds. Organizations like Occupy Wall Street and #Blacklivesmatter are movements that, unlike the protest movements in the 60’s, exist and function without a hierarchy of leadership and more so function as networks of individuals across the country that can organize protest demonstrations through social media in short periods of time. Information can be gathered and shared from person to person in such a way that it’s hard not to take notice that the people are not happy. In the United States of America, it is the Gregorian year 2016, an election year. Social and political issues have been bubbling for some time now. Protest demonstrations seem to be happening every week. People from celebrities all the way down to the common person are speaking out against social injustice and economic issues. The protest has almost become the standard for how people express their disapproval of corporate or political powers. Is this the final solution? Is this the answer to bring about the change that we wish to see in the world? Can we honestly say that indigenous rights movements are successfully winning? No. Legislation has not changed. Are the Arab countries better off today than they were before Arab spring began? No. Many of them are riddled with civil wars, bombings and continued protests. The Occupy Wall Street movement that seems to have now fizzled down has left Wall Street standing and functioning as it was before the movement began. Black Lives Matter protests seem to stay with something fresh to protest about. Too often, some unarmed person of color is murdered by police. Can we say this has even slowed down since #BLM protest began? No. What’s even happening now in America is that a group of people will unite to protest something, and another group will come together to protest their protest. Yes you read that correctly. There are protests and then there are counter protests to the original protest. People are clearly unhappy, but people are also greatly divided. I stress to the reader that maybe it is time that we begin to change how we view the world we live in. It is one thing to be able to identify the corruptions and evils that we see in the world, but it’s another thing to take an honest look at our contribution to that corruption. Do we believe that if we were the ones in power, the world would be a better place? Are we really that different from the ones we think are causing this growing disapproval? I would challenge the honest reader to take a look inside themselves to find the answers to these questions. For me the answer is clear. It’s time I return to what was working for my Ancestors. – Be good.